This November, two of the biggest comics in the world collide as STAR WARS and DARTH VADER collide in the epic VADER DOWN crossover! But first, Marvel is pleased to present your first look at the VADER DOWN #1 JAXXON VARIANT from writer/artist Chip Zdarsky (Howard the Duck)! Available only in comic shops on November 18th, don’t miss your chance to own this one-of-a-kind variant cover. When Darth Vader accidentally finds himself facing off against the Rebel Fleet on his own, the Rebels will learn the true strength of the Dark Side of the Force! Once Vader crashes on a nearby planet, the Rebellion is willing to risk everything for this once-in-a-lifetime chance to take out one of their biggest enemies! 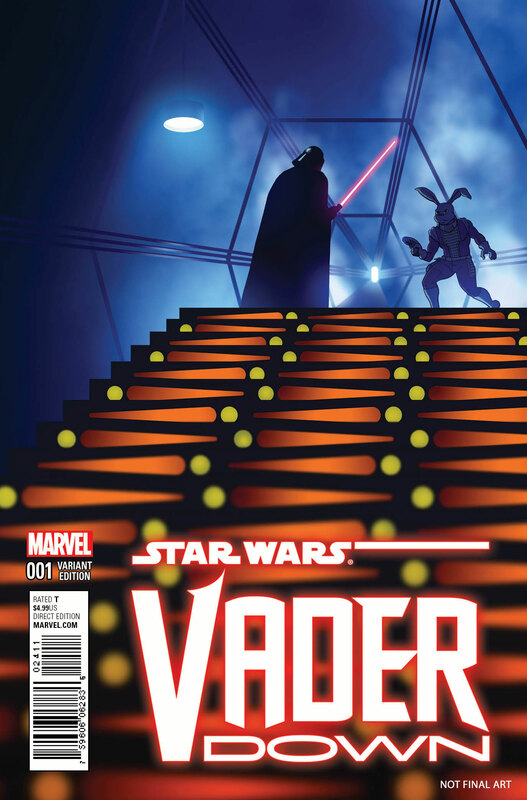 Be there as this can’t miss crossover event begins in the oversized VADER DOWN #1 this November and continues in the pages of STAR WARS and DARTH VADER!